Have we reached a global tipping point to irreversible ecological change and how do we measure it to avoid it? This rather large group of scientists (science – it’s a collaborative thing) all came together to write this paper in Nature last month to try and work out whether you could have global ecosystem tipping points, whether they could be measured and predicted and what that means for humanity. Short answers: yes, yes in hindsight, possibly with difficulty, not good news. However, when talking about ecosystems and the planet, that bit about annihilation isn’t so fun. It’s used in this paper to refer to what gets commonly called ‘tipping points’ where a system gets pushed and pushed and then collapses. The proverbial straw that breaks the camel’s back. For example where you over-fish a lake so much that there’s not enough fish left to survive and the fishery collapses. So what happens when those kinds of shifts occur not at a localised level, but at a whole-planet level? There are a few examples from history that these scientists have used to try and work out what might happen – looking at the transition from the last major ice age 11,000-14,000 years ago as well as the ‘Big Five’ mass extinctions (dinosaurs etc.). Most ecosystems are not in a continual balanced state, but exist within a range, which means it takes a certain amount of forcing to get them to change. Similar to the amount of forcing it takes to get me out of bed for a 6.30am run, but on a global scale. The thing is, the way ecosystems react is different for each one, so it is really hard to predict a tipping point and you often don’t know where the threshold is until afterwards. There are trademarks of a tipping point that will lead to a biosphere shift; mostly it’s extinctions in global, regional and local species. These historically occurred to an area once 50% of it had been affected or changed. So the key question then becomes, how can we predict it? Humans have changed 43% of the earth’s surface for our own purposes already through agriculture and urbanisation. We have increased the amount of CO2 in the atmosphere by 35%, and increased the acidity of the oceans by .05pH which is already leading to coral bleaching and oceanic dead zones (see my blog on ocean acidification). With this amount of human-caused change already and an expected world population of 8.2billion people by 2025 placing even greater strains upon the planet’s resources, there is no question that the major drivers forcing climatic change today are human-caused. Population growth, resource consumption, energy consumption and production, habitat transformation and fragmentation and climate change are all being unbalanced by human activities. What the researchers wanted to try and work out was by how much and if there is a tipping point, have we reached it yet? 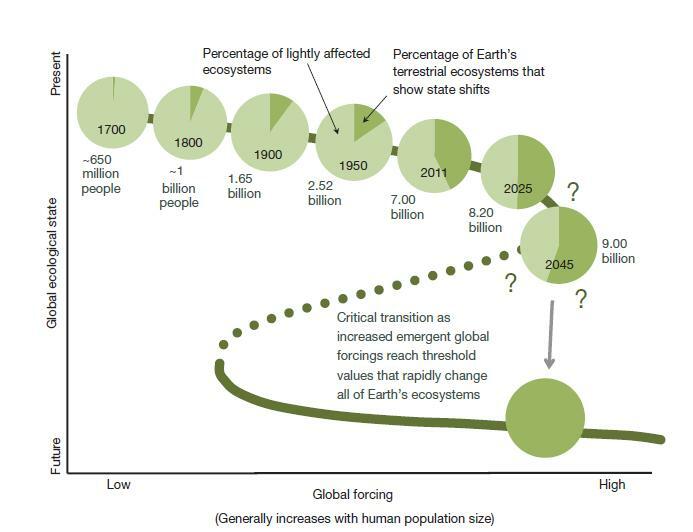 The likelihood of having reached a tipping point becomes much greater once we’ve changed 50% or more of the earth’s surface, which is predicted by this paper to be in 2025 using current projections of population growth and average land use per person. But there’s always uncertainty in the numbers because you can’t factor in the unpredictable changes or the changes humans may make, so the paper recommends in-depth monitoring of ecosystems where there is still little human activity like National Parks. The more data that can be collected on what is happening to our ecosystems the better, because there can be lag times in systems as well, which might mean we cross a tipping point without realising it until it’s too late. The authors state that “another global state shift is highly plausible within decade to centuries if it hasn’t already been initiated” which is kind of terrifying, especially when you start to think about what kinds of “rapid and unpredictable transformations” might occur. Hindsight will be 20:20, but it’s pretty essential we don’t get past the tipping points if we want to keep our currently comfortable and liveable planet. I’ll leave you with the conclusion of the paper itself, because I think it’s pretty clear on what needs to happen next. This entry was posted in climate change and tagged global change, tipping point by amyhuva. Bookmark the permalink.